I don't know why I find this particular postcard so irresistible, but I do. This was the one that made me cave and finally order the whole damn box of Jetoy Choo Choo postcards from an eBay seller in Korea. (They are not cheap.) So I sent it to a very special friend who will appreciate it in all its adorable weirdness. It is adorable and it is weird. Sort of like a stoned reindeer cat. Totally mesmerizing. I love it! It's the perfect amount of weird for my tastes. It is quite adorably weird. The apple ... kittydeer know that an apple a day keeps the crazy man in the red suit away. Haha! That postcard is amazing. I think I like the bird the best, it looks like it is on a mission. Yes. The bluebird does it for me. with the apple and the reincatdeer. 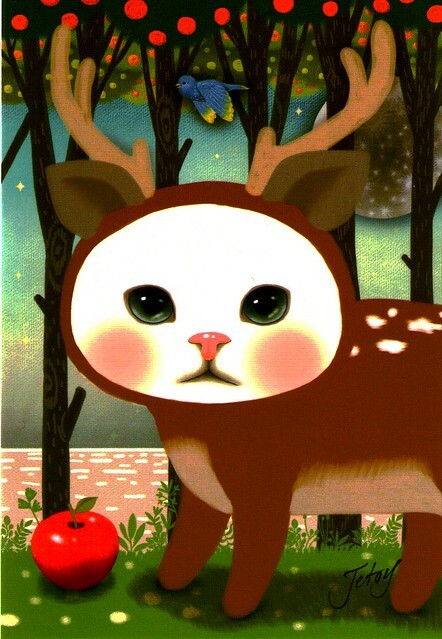 Of course the apple just fell from the tree, they ripen at Christmastime in CatDeer land. Lovely. Thanks for sharing! I got some Jetoy postcards at www.aliexpress.com I was afraid to get some low quality copies, but they seem to be really from Jetoy and they are adorable! 40 postcards for U$13.00 and free shipping.